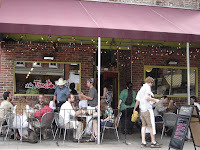 In spite of a delicious, filling dinner at Calhoun's, we woke up on Sunday ready for Sunday Brunch at The Tomato Head in Market Square in Knoxville. There were several places in Market Square that sounded yummy, like Trio and Cafe 4, but we were looking forward to The Tomato Head. There's some nice outdoor seating, but unfortunately there were no outdoor tables left when we arrived so we settled for a table inside. It's a bit noisy inside, but cute and comfy. Sunday Brunch has an Omelet Bar and Belgian Waffle Bar and we both enjoyed watching omelets and waffles being made. We both opted for egg sandwiches and a shared slice of breakfast pizza. 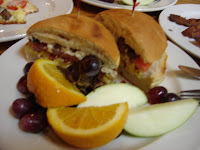 I chose the 'Hank' - organic scrambled eggs, bacon, feta, tomato, and kalamata olives on a white bun. It comes with fruit next to it - orange slices, apple slices, and grapes. 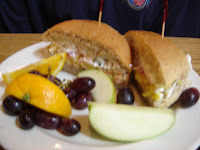 SP chose the 'Goldie' - organic scrambled eggs, smoked salmon, capers, goat cheese, and red onion on a whole wheat bun. 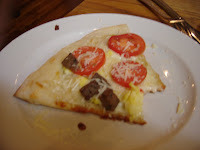 For our breakfast pizza toppings we chose tomato and homemade lamb sausage. Unfortunately, the breakfast pizza had garlic on the crust, so I didn't try it; I did pick off some lamb sausage and it was delicious. SP ate the slice of breakfast pizza and said it was quite tasty. The Tomato Head is definitely worth a visit. After licking our plates clean, we drove the 3.5 hours to Dahlonega, GA. Dahlonega is in the north Georgia mountains. We checked into our hotel and then went to my brother's house. My parents were already there and had the sangria and chips with hot artichoke-parmesan dip ready!!! We sat out on the deck and enjoyed the weather. My brother's backyard is woods so it is very nice & secluded & relaxing. They have 2 dogs and both are very well behaved although my brother swears that Mack is a trouble-maker!! For dinner, my brother smoked brats, chorizo, and hamburgers. I think my brother started smoking when he moved from OH to KY about 9 years ago. He has had several smokers and usually modifies them to his liking. I think the smoker he now uses is one he bought when they moved to GA 2 years ago. I always enjoy watching him smoke out the neighborhood!!! The bratwursts and chorizo were very tasty but the hamburgers - oh my gosh. I wouldn't have thought to smoke burgers but the burger I ate was so juicy and had the most amazing smoked flavor. It was so good that I am now lobbying SP for a smoker just for smoked burgers!!! I think we had fruit salad, too, and a peach pie for dessert, but mostly I remember the burgers. So good. After dinner there was the usual 'family vacation' game of C-L-R (a dice game) made all the more 'interesting' this year by allowing the 4 year old to 'roll' the dice!!! We also played Uno and SP won so many games that my 4 year old nephew said,"You can't play anymore because you keep winning" and then later," You can play but only if you promise not to win" - !!!! !